Few houseplants make a huge impact like this one. This jungle giant is surprisingly easy to please indoors. 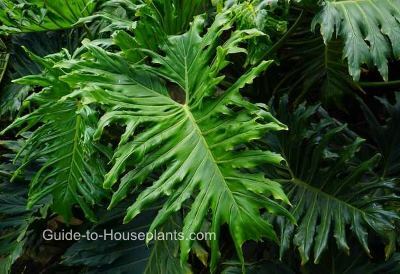 Although it prefers high humidity, split-leaf philodendron is fairly tolerant of most homes. Use a room humidifier, if you need to boost the moisture in the air. This stunning philodendron plant is a tree-like shrub. Young plants have sturdy, upright stems, which tend to lie horizontally as the plant ages. They eventually sprawl to become twice as wide as they are tall, so give your house plant plenty of room to spread out. Better yet, give it a trellis and watch it climb. The foliage is stunning. When young, the glossy, heart-shaped leaves are deeply indented, and become more deeply cut as they grow. Some varieties of split-leaf philodendron have wavy margins. Big leaves are dust-catchers. To clean them, gently wipe the leaves with a damp cloth. Repot in spring or early summer. Use a container with drainage holes to prevent root rot. Once the plant gets big (top-heavy), it's a good idea to use a heavy container to keep it from toppling. Long aerial roots may appear near the base of the plant. Tuck them back into the pot. This plant is also known as P. selloum and may be sold under that name. A few named varieties make good house plants. 'Xanadu' philodendron is a newer cultivar with smaller leaves than the species and only grows to 3 ft (90 cm) wide. 'Hope' is a vigorous, full-sized hybrid. 'German Selloum' has finely cut leaves with wavy lobes. Looking for this look-alike? There is a similar-looking plant that goes by the same common name. Swiss Cheese Plant isn't a philodendron at all -- it is Monstera deliciosa. Light: Moderate to bright light. No direct sun, which can cause brown scorch marks on the leaves. Water: Keep soil moist spring through fall. Allow surface to dry out between waterings in winter. Yellow leaves are caused by overwatering. Humidity: This rainforest native prefers humidity. Mist foliage occasionally. If your home is really dry, use a room humidifier to boost moisture in the air around it. Propagation: Division. Cut through the thick roots with a serrated knife and pot up the plants separately.